There are 5 new Grocery offers from SavingStar available from today. 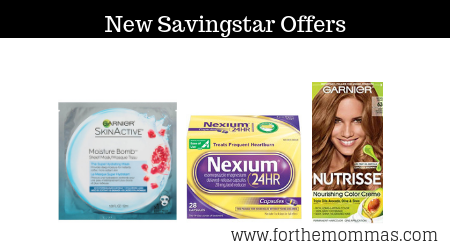 You can save up to $10.50 on Nexium, Garnier and more with the newest SavingStar offers. SAVE $2.00 off any ONE (1) Nexium® 24HR Product.Expires 4/2/2019.Save $2.00. SAVE $5.00 off any ONE (1) 28 ct. or 42 ct. Nexium® 24HR Product.Expires 3/17/2019.Save $5.00.